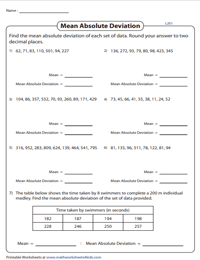 Walk through this compilation of mean absolute deviation worksheets, hand-picked for students of grades 6 and 7, to bolster skills in finding the average absolute deviation of data sets up to 6 and up to 10 offering three levels each. Level 1 features whole numbers up to 99, Level 2 involves 2-digit and 3-digit whole numbers while Level 3 comprises decimals. Learn to compare data sets and apply skills acquired in solving word problems. 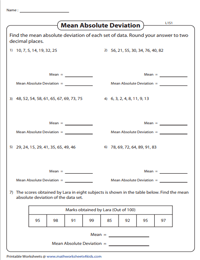 A thorough knowledge of calculating the mean is a prerequisite in solving the worksheets presented here. Determine the mean and deviation (the difference between each data value and the mean). Find the absolute or positive values and the averages of these differences to compute the MAD for each data set. Level up with data values involving 2-digit and 3-digit whole numbers. Compute the mean, the distance and the average of the distances. 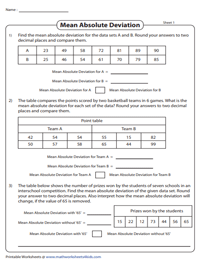 Complete four tables and solve a word problem in each worksheet. 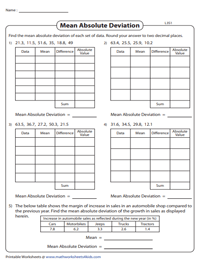 Direct 6th-grade students to find the average of the positive distances of each data value from the central point or mean for the sets of decimal data values presented here using the mean absolute deviation formula. 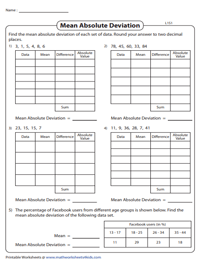 Intensify your practice in finding the mean absolute deviation of data sets up to 10, with these middle school worksheets. 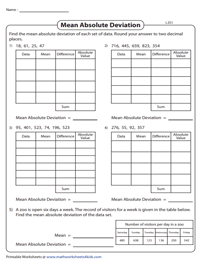 Find the mean and the average of the distances using the table templates provided. Plug in the mean, absolute deviation and the number of data values in the mean absolute deviation formula to solve the word problem and the sets of data values offered in each mean absolute deviation worksheet. Packed in each worksheet are 6 sets of decimal data values. Determine the mean absolute deviation of each set and round the answers to two decimal places. Review concept by solving a word problem. 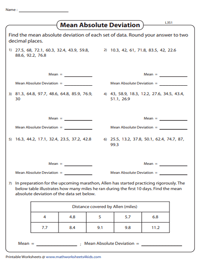 Compare two distributions of data by calculating their means and MADs in these sixth and seventh grade worksheets. A larger MAD indicates a widely spread out data while a smaller MAD implies clustered data.